A young lawyer for the Environmental Protection Agency had a heavy feeling as he headed to work one morning last week. Like many EPA staffers, he’s been distraught over the steady stream of negative news about the Trump administration’s plans for his agency and what it all means for his future. That morning the White House had released its budget proposal, calling on Congress to cut 31 percent of the EPA’s budget, more than 50 programs and 3,200 of the agency’s 15,000 employees. 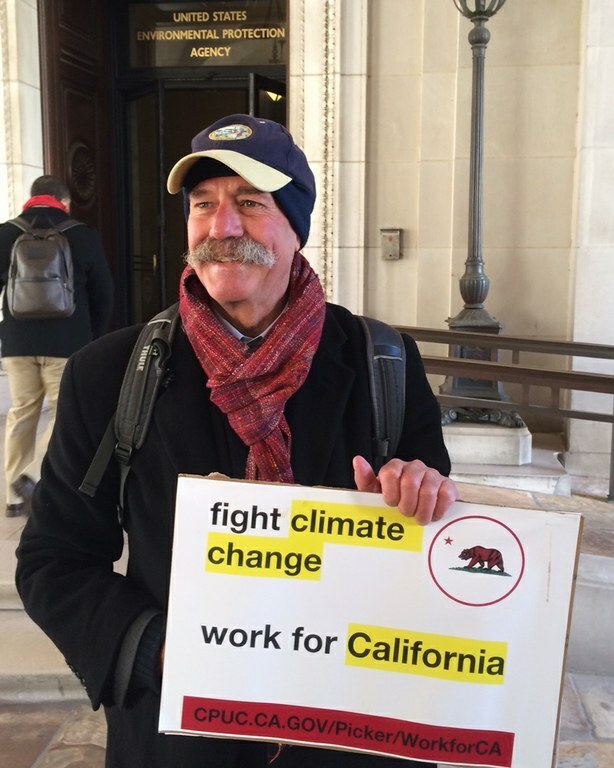 A man with a bushy gray mustache exclaimed: “I’m recruiting for California jobs!” and introduced himself to the EPA lawyer as Michael Picker, the president of California’s Public Utilities Commission, which regulates electric companies and other utilities. 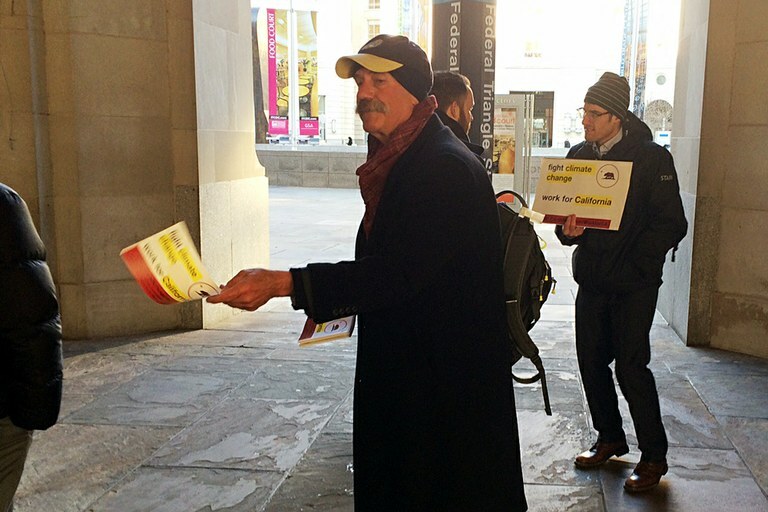 Michael Picker, President of the California Public Utilities Commission, stands outside of the EPA headquarters to recruit employees for renewable energy jobs. Picker explained that he has 250 job openings and more on the way. California’s Air Resources Board and Energy Commission also have opportunities for federal employees frustrated with the direction the Trump administration is headed. “All the jobs will have impacts on climate change in some ways,” he said. The EPA lawyer said his encounter with Picker last week lifted his spirits giving him a sense of “relief” and “hope.” He’d already considered seeking a job in California, where the state government has a strong commitment to environmental protection. “There’s a pull and a push, especially with the budget coming out today,” added the lawyer, who like other EPA staffers didn’t want his name used for fear it would put his job in jeopardy. Are you a federal employee? Think we should know something we don’t? Here’s how to tell us, securely. This was just the kind of encounter that Picker hoped for when he decided to turn an already planned trip to Washington, D.C., into a mini recruiting mission. His goal was to try to lure talented federal employees to California state government by promising them a chance to work someplace still committed to fighting climate change. He also spent a morning passing out flyers at the Energy Department. But he was especially happy with how things went outside EPA’s headquarters. One EPA staffer ran inside and returned with a resume. An EPA engineer asked for extra fliers for his colleagues. Picker passed out business cards, offering to help the D.C. refugees navigate the cumbersome hiring process at California state agencies. “Thank you for offering to rescue us!” one EPA staffer bellowed as he walked past. Picker’s challenge is bigger than getting companies to generate cleaner electricity. He also has to ensure they make investments to transform the electric grid to meet the challenges of all the additional renewable power that’s coming on line. California wants to lure EPA, DOE and other agency employees to work in California. She said she thinks California is smart to try to lure away EPA’s talented employees at a time when their current employer is making it clear their work isn’t valued. She will definitely consider moving to California for a job, she said. Fundamental changes are on the way, given that Pruitt and President Donald Trump have vowed to undo the biggest efforts undertaken by the EPA during the Obama administration—regulations to slash greenhouse gas emissions from cars and power plants and protect wetlands and waterways. EPA staffers will be charged with justifying the elimination of regulations that they or their colleagues spent years crafting. As Picker was wrapping up for the morning, a bundled-up bike commuter rode up to ask about an application he’d already sent in. Picker promised to help and then took a photo with some volunteers who had showed up to help him pass out fliers. One was a corporate lawyer, another a former Energy Department official and third a solar executive from Oregon who was in town for business.